It is mid-November and most of the gardeners I know have pulled up the last of their crops, turned the soil over and put the garden to bed until spring. Last year I did the same. This year I decided I wasn’t ready to quit yet. 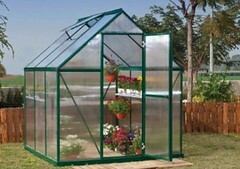 I had been doing some reading on cold frames and greenhouses. Then I picked up a copy of the Winter Harvest Handbook, found that many root crops and some leafy greens will grow in the cold of winter and I decided I could do this: I’d just have to do it the mountain man way. All of the instructions I’d seen on building a normal greenhouse start with “find a flat, level spot…” I have no flat, level spots. But I had installed 4’x4’ raised garden boxes as a way to keep my crops from washing down the hillside every time it rained hard. Could I not simply build on that? The following was my solution. Allow me to preface this with the disclaimer that I am not a master gardener, nor a greenhouse engineer. At this point the whole thing is newly built and untried. I’ll be happy to let you know if it works out (or not) as we go along. 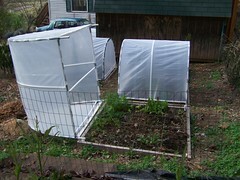 My idea was to build mini-greenhouses that will fit over my garden boxes to protect the plants inside from damaging winds and snow. The Winter Harvest Handbook – written by Elliot Coleman who runs a year-round farm in Maine – offers a whole list of vegetables that will grow in cold weather and many helpful tips on winter gardening without hot houses (heated greenhouses). The big thing is to protect them from the wind. And by retaining some solar heat on nice days, the plants will grow a little better than if left exposed to the normal winter temps. Requirements for me were keeping the cost down, keeping complexity down, and making them easy to either re-purpose in the spring or break down and store compactly. 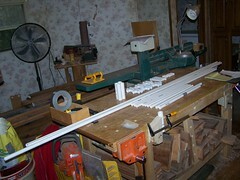 I decided to use ½” ID PVC tubing because it’s light weight, flexible, and inexpensive. This design uses tubing and Tees, some plastic sheeting and duct tape. Getting the measurements for all the pieces was the hardest part. 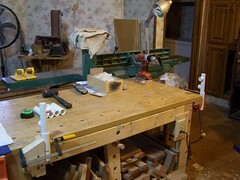 Once I had those worked out cutting the tubing to length and assembling the frames took only a few minutes per house. 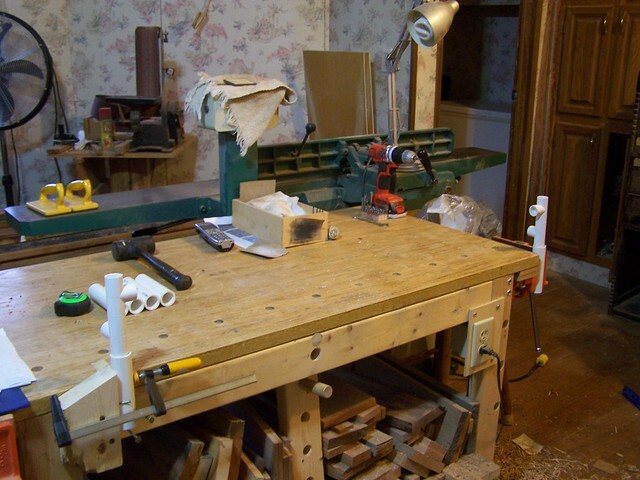 I did build a fixture on my work bench that holds a couple of the sockets (made from 1” PVC) that go in the corners of the garden boxes at precisely the right distance apart to help me assemble the frames. Most of this is not difficult at all, but bending the hoops that for the top and plugging them into the leg and rail assembly proved to be a challenge if they were left loose. Cut the 6 10 foot long sticks of tubing to the lengths needed for the framing parts, and assemble the Tees to form the connectors. I used no glue in assembling these hoop houses so I could make adjustments if needed now, and could dismantle them for storage next spring. Where tensions threaten to pop joints apart I use a piece of duct tape wrapped around the connector(s) and tube. Assembling the frame goes very quickly. There is one critical factor that must be remembered during frame construction – especially if you are using glue: take it outside before the final assembly! At almost 4’ square and over 3’ high, the frame will not fit through many doors. 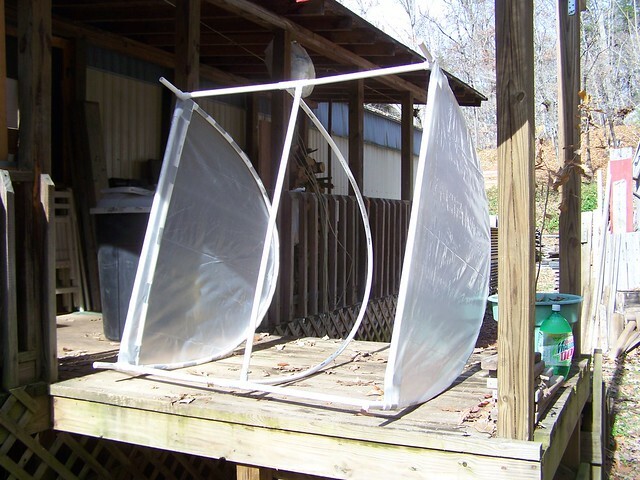 I assembled the end frames and covered them with plastic, and assembled the center hoop and side rails then took the three pieces outside to do the final assembly and apply the top cover. I used 4 mil clear plastic sheeting that I bought at Lowes. I wanted UV resistant plastic, but that wasn’t available locally and mail ordering it would delay this project by 2 to 3 weeks. Since I will probably tear the plastic up when I remove it next spring, it may not matter if it doesn’t last more than one year. I fasten the plastic to the tubing with good quality, exterior rated duct tape. Not classy looking, but effective. 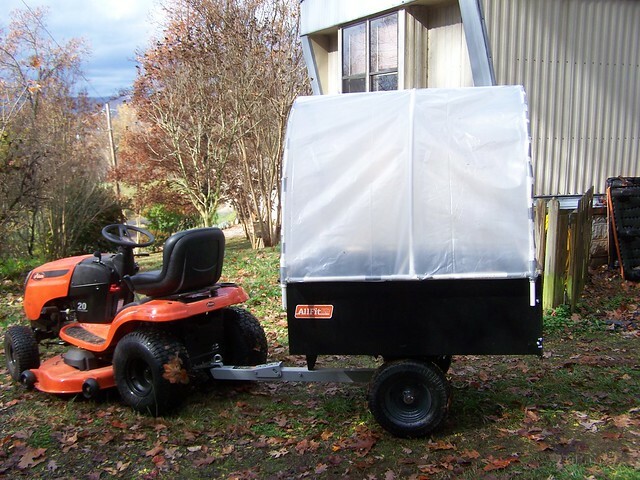 I used my garden tractor and cart to transport each hoop house from the workshop down to the garden. They are not heavy – weighing just a few pounds – but are fairly bulky and tricky to carry very far. Marie said it looked like I had built a covered wagon and was heading “out west”. The “legs” on each corner slide down into the sockets to hold the frame in place on the garden box. Lifting it enough to clear the legs and tipping the cover back makes a simple way to access the plants inside. 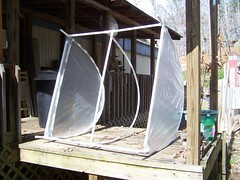 I will need to rig a method of tying down the frame so it isn’t lifted off and blown away in high winds. There is enough friction and tension in the foot-socket system to hold well in moderate breezes. 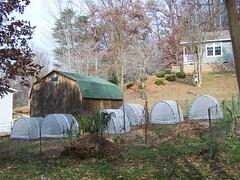 I built enough hoop houses to cover all six of my garden boxes, although I may not plant in all of them. At the moment I have carrots, spinach, chard, onions, garlic, mesclun lettuce, leaf lettuce, Brussels sprouts, thyme, rosemary, sage and oregano planted and growing. Each will grow slowly in the colder temperatures, so I’m stagger planting my crops hoping for stepped harvests through the winter. I may add turnips and beets. New plantings will have to be sprouted indoors and the seedlings transferred to the hoop houses because the seeds will not germinate in the cold ground. But once sprouted, they will grow and provide us with fresh vegetables. If this experiment works out, I plan to produce a small book to serve as an illustrated guide with exact dimensions, processes and tips on building these hoop houses. I may even offer pre-cut parts as kits for those without the proper tools. My rough figure is that I put less than $20 worth of materials into each of these houses, all total. Since they can be knocked down and stored for the summer and re-used for many years, only having to replace the plastic ($4 per house) that’s not bad at all. 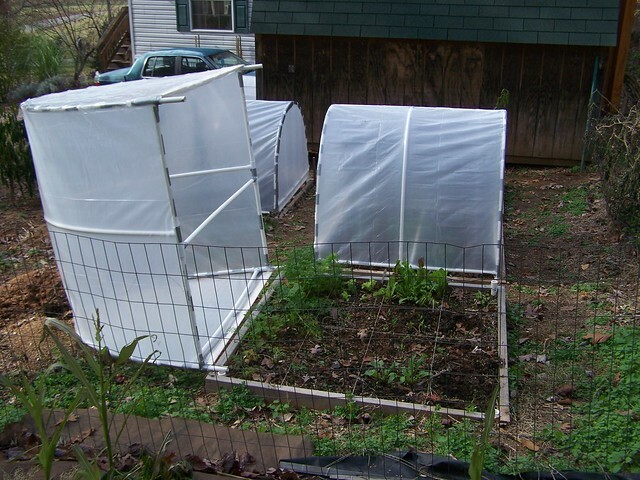 And I do have the option of covering the frames with chicken wire (excuse me… poultry mesh) and using them to keep pests out of my plants during the summer instead of using my practically ineffective perimeter fence. This fence keeps the dogs and deer out, but the rabbits run right through it. Stay tuned and I’ll let you know what issues turn up and how I address them. If you are a greenhouse expert and care to whisper in my ear about problems I can expect, that would be greatly appreciated. 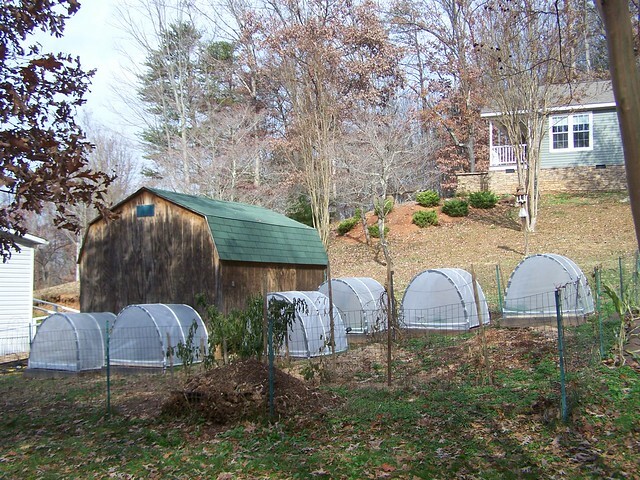 Good article Allan...I'm new to the blogs but your hoop houses caught my eye. I experimented with building one over the New Years weekend and it's pretty much like yours. I'm in the Gulf South so our winters are milder than yours with no snow, although we do catch a few mid 20's here and there. With that I can keep a fall/winter garden pretty much with no problems. I wanted a hoop house as mainly a seed starter. I used the same size pvc but glued the joints together. I have mine on flat ground (that's all we have down here, lol) and locked it down by placing the pvc on 24" re-bar hammered about 12" down. The downside is, rather than building it first as you did, I put it on the re-bar as I was building it. As such, the stress on the sides of the pvc keeps it from being easily removed. I then covered the frame with 6-mil plastic and weighted it down with 2x4's and bricks. There's a thermometer hanging from the ridge pole and on a sunny 70 degree day it can easily hit 100 inside. 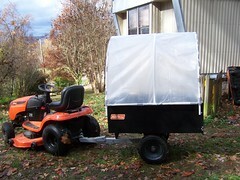 But the plastic can easily be pulled up for ventilation and tucked back in at night. Right now I have just a couple of flats of tomatoes growing to see how they get through the frosty nights and so far so good. The whole cost was about $50, the roll of 6-mil plastic was half of that and I have enough left for a second hut if this one is successful. Your hoops look like they are fairly straight for 6 or 7 inches, try re-bar stakes and see how they withstand the wind. Good luck. Allan, it looks like you have been one busy little beaver building hats for your gardens. I'm going to try an experiment this winter too. Mine will be in the basement with grow lights. I'm just not into tromping outside in the snow and cold if all I have to do is trot on down to the basement to harvest a salad. Maybe I'll try some Mesclun weed salad in the house and see if it can survive the inside temperatures. The basement is about 10 degrees colder than the rest of the house which is at 68 degrees during the winter months. I hope that's not too cold. Have a great day in the fall/winter garden. Thank you! I had seen that before but forgot about it. Will be interested to learn how you fare. I believe it may be too cold here for most things, but, this will address my problem of squirrels, chickens, dogs, etc, etc. Like most city gardeners, everything loves my garden! I will use the poultry mesh on mine!